This Tuesday on the last Yarnthing Podcast of 2013: Jeanne Carver of Imperial Stock Ranch: from Oregon to Sochi 2014! The Imperial Stock Ranch is a family owned and operated ranch located in the high desert area of Oregon. Dan and Jeanne Carver are the fourth owners of Imperial Stock Ranch. It was started in 1870’s by Richard Hinton. 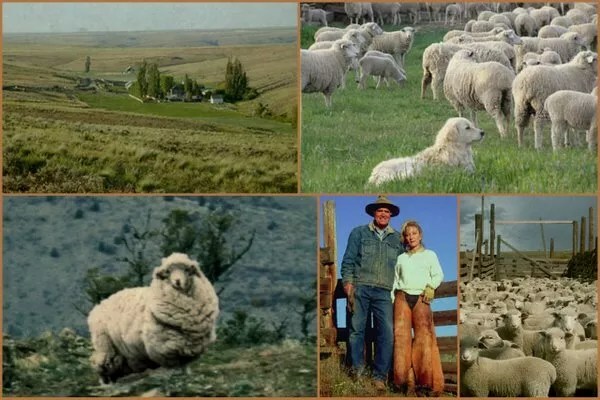 He started raising sheep in the 1880’s and helped develop the Columbia breed of sheep which is ideally suited to the high desert terrain and produces high grade wool. James Hinton took over from his father in 1915 and kept expanding the empire. Through various family dramas and such, he ended up selling the ranch in half-stakes to George Ward who took over the ranch fully in 1967. George Ward then sold the ranch to the Carvers in 1988 and they have been running it since. You can read all about their sustainability practices, their designation as a National Historical District, and their educational program on the Imperial Stock Ranch website. The Ranch didn’t always produce yarn. Originally the ranch sold their wool, but in 1999, the buyer that had been buying their wool for 100 years told them they were moving overseas and wouldn’t be buying their wool anymore. At the same time, the US domestic production of lamb (the other big product of the ranch at the time) was being decimated by imported frozen lamb from Australia and New Zealand. They started making yarn on-site and Jeanne became involved in the local knitting guild. Their business grew and in 2009, they started collaborating with designers including Oregon knitwear designer Leigh Radford and internationally known fashion designer Anna Cohen. You can find all the yarns and patterns from Imperial Ranch Yarns on their website ImperialYarn.com. It isn’t out right now, but Anna Cohen’s Imperial Collection will be available in Fall 2014. Now this isn’t the end for Imperial Yarn. Last year, out of the blue, Anna got a call from product development for Polo Ralph Lauren. They were starting to source American yarn for the 2014 Sochi Olympics but weren’t letting that info out yet. Anna sent off a few samples of their yarn and had a few more conversations with her guy in New York. A few months later, the design team from Ralph Lauren came out to see the ranch. Still not knowing what the yarn was for, they made an order in December of 2012. Now, over 40 US producers and manufacturers are part of the Made in the USA effort for the apparel for Team USA at the 2014 Sochi Olympics. Ralph Lauren has produced a video all about the journey of the opening ceremony sweater which you can see below; listen and watch for Jeanne! Listen in below to the podcast to hear the whole story! You don’t just have to watch their Olympic yarn, you can get it yourself! Erin, a worsted weight 3-ply wool is available in a variety of colors on their website. You also might be able to find the official Olympic colors at your local yarn shop, check their website here to see if it is available in a yarn shop near you! Imperial Ranch Yarns produces 10 yarns and rovings that include not just wool, but also alpaca and cotton in amazing colors. Check out all their yarn and kits here. As always the GIVEAWAY! Leave a comment below for your chance to win the Rhombus Feather Shawl Kit in the color Rain. Marly will announce the winner on the first podcast of 2014 on January 7th. What an interesting story! I am hoping for some sunlight through the snow while I am knitting! Great show! I hope the sunlight shines soon. What an amazing story! Thank you Jeanne for what you are doing. When I watched the short video I had goose bumps of sunlight run up my arms! Jeanne should write a book her story is amazing and she tells it so well that she fills my soul with sunlight. Snowflakes in sunlight would be much prettier than just snowflakes! Loved the show it was really interesting to hear about the history of the Imperial Stock Ranch. Sunlight is in somewhat short supply here in the Midwest these days, but plenty of rain and especially snow! We definitely need more Imperial yarn here in Wisconsin. Sunlight is lacking during Michigan winters. Very interesting show, love Jeanne’s enthusiasm. I found the story about imperial yarn’s journey to the Olympics to be heartwarming, just like sunlight on a winter’s day. I am excited to see the Olympians in 2014. I loved hearing the story of your ranch and howe your yarn will be represented in the Olympics. I really like that you stress the need to care for the land and how the sunlight begins the cycle of sun to grass to sheep to skins, fleece, and meat. I would love to visit some day and go through the tour that the Ralph Lauren design team took. Jeanne’s story is very inspiring and heartwarming – like a beam of sunlight on a cold winter morning. What a great podcast to end the year! I love the idea of sunlight creating the yarns we all dearly love. I had never thought of it that way, but she’s right! I would love to try some of their beautiful yarn! Loved this show! I found Jeanee’s story so interesting & moving. I love Oregon and would love to live there again. I lived in The Dalles for a year and the Columbia River Gorge is breathtaking with los of sunlight! Thanks for the wonderful show as always Marly!! Such a great story–the cycle of sunlight to grass to animals. My family farm is also four generations strong. Thanks for the chance. Loved the Podcast. wow, what a story of American perserverance and God’s blessing! My husband is from So OR, and a visit to the ranch, to see the sunlight on the fields, would be a wonderful stop! Enjoyed the Imperial Stock Ranch story. Although it was raining today, the sunlight did indeed peek through the clouds. I could hear the sunlight in Jeanne’s voice when she talked about the ranch. Can’t wait for the Olympics!! The interview put some sunlight to this rainy day. Very entertaining and fun and Jeanne and Marly is inspirational. What a fabulous story. I’d love to travel from cloudy western Oregon over into the eastern Oregon sunlight and get a tour of the Imperial Ranch. This was a mesmerizing story, and Jeanne’s passion and devotion is obvious. She’s a great story teller, too! I will definitely be encouraging my LYS to start carrying her brand! Oh, and I’d love to win this giveaway, too! Such an interesting podcast with plenty of history. I would love to have heard more, sitting with a cup of tea and sunlight streaming through my windows. This was a mesmerizing story, and Jeanne’s passion and devotion is obvious. She’s a great story teller, too! I will definitely be encouraging my LYS to start carrying her brand! Oh, and if I had a porch, I’d love to sit and knit and spin in the sunlight, too. Thanks for such a fascinating and inspirational interview. Sunlight is definitely the source of energy for life, from oxygen all the way to our food and clothing. Thanks for this alternative to offshore production, and for keeping this industry alive in America. I’ll be watching for these sweaters in the Olympics! As we are getting 3 inches of rain here, I won’t be seeing any sunlight today, but it was a perfect day to listen to this podcast and hear such an amazing story! Thank you! This interview was like a ray of sunlight on a rainy day. I could hear the love and respect for history, family & service. Just beautiful. Fascinating story! Knitting in the winter sunlight while listening. Most people can only dream of a job they love. The love of your sunlight job shone through in your voice. Congrats on representing the team USA at the Olympics . What this country needs is more grass root efforts to bring pride back. Bless you and your efforts! Another fascinating interview! It was a little bit of sunlight on a cloudy day..
What an interesting story! I love Jeanne’s perspective on sunlight too–I think of the same thing when I’m gardening. What an amazing journey Jeanne has spearheaded. I’m heading out to my LYS to make a purchase! May the sunlight always shine on this wonderful company. I would love to come see the sunlight shining directly on the Imperial Stock Ranch. Jeanne is a great storyteller–she really makes the ranch and all the people and animals come to life even for those of us far away in Colorado. Congratulations to you too, Marly, on another successful year, and thank you for continuing to bring us the podcast where we can learn more about others in the industry, as well as about you. This was an excellent story. I am adding a visit to the ranch to my bucket list. I would live to see the sunlight on the mountains!! I fell in love with the ranch as soon as I heard their story…I was a bit envious because it was always a dream of mine to step back in time and live the life. May the sunlight always glimmer on you Imperial Stock Ranch and on you Marly for sharing the incredible story with us through the podcast. I’m new to your podcast, I just found it on Stitcher! What a ray of sunlight! I listen to podcasts when I have a hard time sleeping, and the Imperial Ranch/Ralph Lauren story woke me all the way up! Had to research. This is a great story of how a huge corporation can use its power to help small businesses thrive! Sunlight is plentiful here, but so are cold temps. Perfect knitting weather. I find the story of modern day pioneers so interesting. And I like to know of companies producing American products so I can help support them. Thanks! I wish there was more sunlight here today. The parade of athletes is always one of my favorite things. I cannot wait to see Imperial Stock Ranch yarn showcased. Congratulations! I loved this podcast, it was such a great story and very captivating. I love the idea of yarn being harvested sunlight. What a fabulous podcast. I just got a chance to listen this morning and so glad I did. We’re having horrible rain storms here and I was wishing for sunlight on the drive into work. I can’t wait to see the Imperial Yarn in action in February!